TRAPA's clear flitches and cants are used for remanufacture of the highest grade of finishing lumber such as veneer, moldings and knot-free finish lumber. This lumber is your best choice when clear recovery and appearance is of upmost importance. 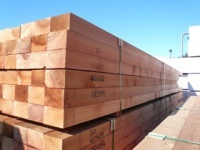 We can supply veneer flitches in Douglas Fir. TRAPA’s clear flitches are reknowned for exceptional quality and often used in the highest value applications such as temple construction and sliced veneer.